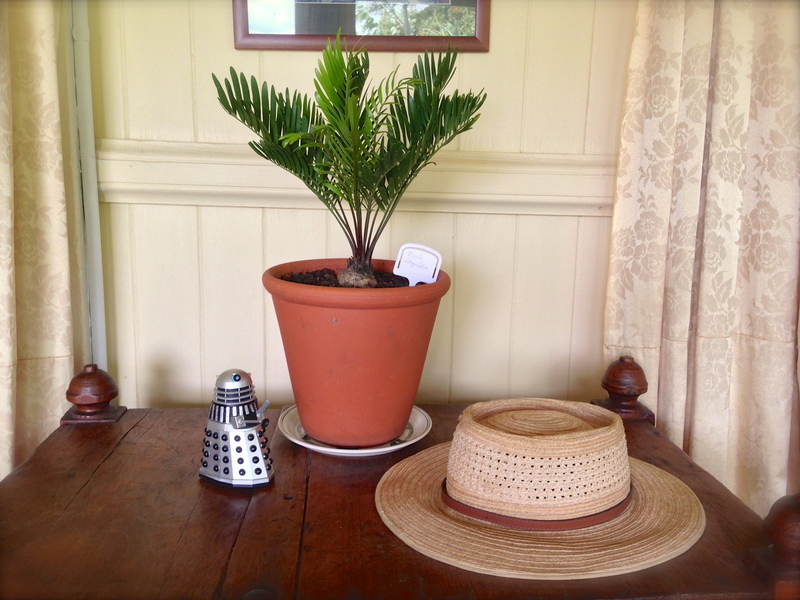 Thanks to the Palm & Cycad Societies of Australia’s annual sale, at Mt Coot-tha Botanical Gardens (8-9.3.14, Brisbane), I am now the proud steward of a clutch of fine cycad seedlings. You can’t really ‘own’ a cycad, just like you can’t really own a Galapagos tortoise, a dolphin or a kakapo. Cycads are special, almost from a parallel universe. Botanists currently believe they are most closely related to the Bennettitales, a plant line that has been extinct in Australia for around 23 million years. Cycads are as long-lived as trees. Old plants store a lot of food, sufficient to last through a long, global meteor-strike winter. Of the 300 or so surviving cycad species, some predate dinosaurs, most are post-Cretaceous, meaning they have evolved in less than 65 million years, some even more recently. (Homo sapiens evolved between 400,000 and 250,000 years ago). Growing up into a big food reserve creates problems for an elder cycad. They are targets for hungry grazing animals. So they’ve armed themselves with nerve poisons, ‘borrowed’ from toxic bacteria living in their roots. Cycads employ these blue-green bacteria to convert atmospheric nitrogen into nitrate fertiliser, which they use. They developed coralloid roots to become their fertiliser factories. To further frustrate grazing animals, fresh, tender new fronds become harder than leather, just days after unfurling. To encourage herbivores to move along, some cycads carry armour-piercing spines that would bring tears to the eyes of any dinosaur, or the mammals which superseded them. Pollen is transferred from male plants to females mainly by insects like beetles, bees, and sometimes by the wind. This morning I bought home-grown seedlings of Ceratozamia hildae (Mexico); Cycas debaoensis (China); Encephalartos kisambo (Kenya); E. natalensis (South Africa); Macrozamia communis (NSW); M. macleayi (Queensland); M. mountperriensis (Queensland); M. moorei (Queensland); Zamia muricata (Colombia & Venezuela), and Zamia picta (Guatemala & Mexico). I just potted up my new Zamia integrifolia (USA, Caribbean, pictured). A crock over the drainage hole of a deep terracotta pot, the bottom third filled with cactus mix, the rest with premium-grade potting mix. When I discovered that the genus Zamia is a critical food plant for the caterpillar of the Eumaeus butterfly, until recently believed extinct, I worked in some llama dung in the top layer. It deserves a fillip. In July 2011, I recorded a segment with Gardening Australia demonstrating how to propagate a cycad by removing a stem bud. At the time I wondered if the cutting of a male Encephalartos altensteinii would drop or keep its fronds, and how long it might take to develop roots. It quickly dropped its fronds. A year later there were still no signs of any roots developing, but the stem bud seemed firm and healthy. So I took it out of its pot and pressed it into some compost rich soil in a warm, sunny and sheltered position by my coffee tree. It wasn’t until 30th October 2013 – twenty seven months later – the cutting developed roots and sprouted a whorl of eleven fronds, each half a metre long. Cycads do things in their own time. Globally, many cycads are threatened by over collection from the wild, and by the loss of remaining habitat to farming and housing. So conserving the last remnants of wild cycad habitat is our duty. I love buying cycad seedlings and watching them grow, it’s the beginning of a new friendship. Noel Burdette, a gardening friend, says it’s like watching grass grow. As a gardener who is fond of watching plants grow, and I especially love observing these curious lifeforms becoming increasingly intricate. Cycads are family plants. Ever seen the way a carpet of coralloid roots bursts into autumn growth? Noticed the vibrantly coloured pulses of life, like coning and seed ripening? Seen the changes in colour and texture in new fronds? New, fronds can be as tender as cling film, then a fortnight later they’re stiff and prickly enough to stop a tank. Cycads don’t grow steadily, they have growth bursts. These can be dramatic, often crowns double their height and spread in a fortnight. Sometimes you’ll be rewarded with two bursts of growth each year. Here’s a tip: when a cycad starts producing a new flush of growth, maximise growth by soaking the soil with seaweed solution and sprinkle some pelletised poultry manure around its base. When they ‘switch on’ their growth phase they respond to this extra care. It’s always a special occasion when a cycad matures and produces it first cones, revealing its gender. Give them perfect drainage, use a premium potting mix, mulch them with a modest layer of compost, and keep renewing this as it decays. Pot them up each year. Water them so they don’t remain dry for too long – most are drought-tolerant – but don’t treat them like desert cacti. Given this basic care, most species are forgiving and many will outlive their stewards. I think of them as a lifelong investment and an inter-generational gift.